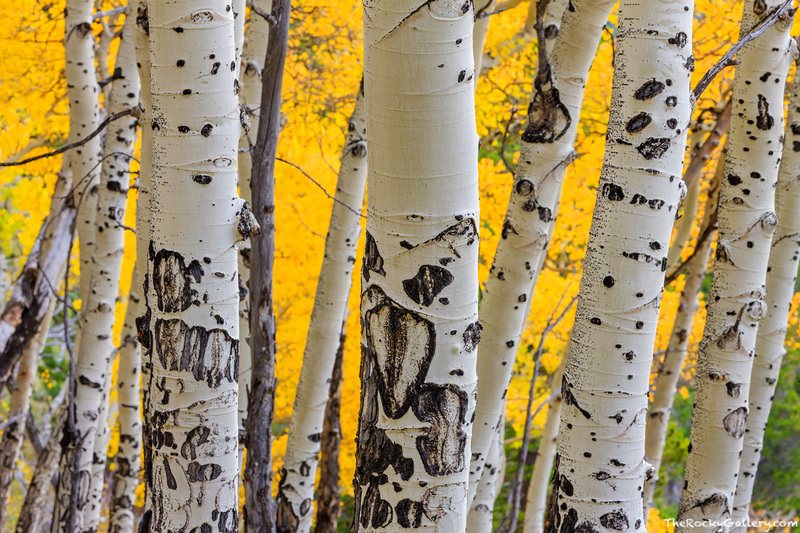 High atop the Bierstadt Moraine in Rocky Mountain National Park reside some of the most beautiful groves of aspen trees in all of Rocky Mountain National Park. Like all the aspen trees of RMNP, the large population of elk leave their mark on the boles of these beautiful trees. During the winter months the elk will chew the bark of the aspen trees for much needed winter calories. While this scars the aspen trees boles, it leaves a unique pattern on the tree. This autumn morning in Rocky I spent hours photographing the golden colors of fall atop the Bierstadt Moraine and the both the scars left on the boles from the elk and brillilant yellow aspen leaves make for beautiful subjects. Photo © copyright by Thomas Mangan.